In true Dunwright fashion, the Depthcharge has a shape and action unique to this category of baits. 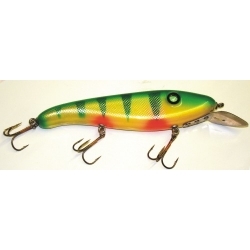 The shape is a combination of the narrow minnow bait and the round crank bait. The Depth Charge moves its' tail from side to side dramatically, an action that truly mimics a swimming bait fish.